From 1940 to 2008, the event was called the “Hall of Fame Game” and featured two Major League teams full of current players. These traditional in-season exhibition games got their start in 1939 as part of the celebration of the newly formed National Baseball Hall of Fame just down the street from Doubleday Field. To help dedicate the newly formed Hall of Fame, two teams of current and former major league players representing the 16 baseball clubs at the time were formed. The teams where captained by Eddie Collins (who was being inducted that year) and Honus Wagner, who was a member of the inaugural induction class in 1936. 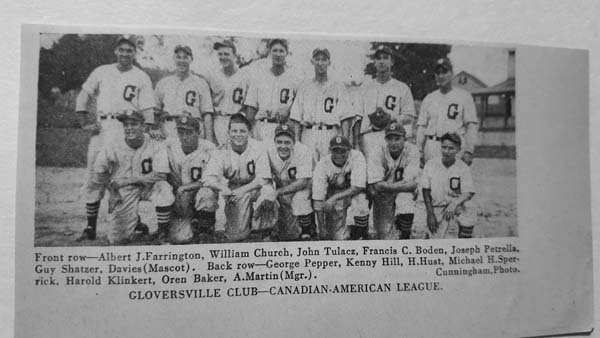 Two years prior to this (and just one year after being inducted into the Hall of Fame), Honus Wagner and the Pittsburgh Pirates Major League baseball team came to Gloversville to play an exhibition game against the Gloversville Glovers professional baseball team of the Class C Canadian-American League. The Gloversville Glovers had begun playing at Berkshire Park (aka Pastime Park & Glovers Park) on Elmwood Avenue (now the site of the Runnings Supply Store/Hannaford Grocery Store/House of Pizza Restaurant) the year before, marking the return of professional baseball to Gloversville for the first time since the A., J & G’s of the New York State league played at A., J. & G Park (Parkhurst Field) from 1906 to 1908. The date was Monday, July 26, 1937, and the Pirates had finished a weekend series at Braves Field in Boston against the Boston Bees (fore runner to the Boston Braves and eventually the Atlanta Braves) and were en route back to Pittsburgh for a game on Wednesday, July 27 against the Philadelphia Phillies at Forbes Field. Upon arriving in Gloversville on the morning of July 26, the Pirates checked into the Hotel Kingsborough on South Main Street (now the ‘Kingsboro’ Apartments) at around 10 a.m. in order to get a few hours rest before a late afternoon game with the Glovers. Several hundred baseball fans where at the hotel to greet the team and a traffic jam ensued on South Main Street. Two of the greeters in the hotel lobby were former professional baseball player and future Fulton County Baseball & Sports Hall of Fame member Russell (Bud) Holmes and his 11-year-old son Jack.Holmes had played against the Pirates Manager Pie Traynor when they were both Major League prospects in the Virginia League back in 1920 (Traynor with the Portsmouth Truckers and Holmes with the Richmond Colts). A dead-ball era baseball reunion ensued in which Holmes and Traynor reminisced about their Minor League days playing against each other. During the reunion, Traynor took a shining to the younger Holmes and appointed him to be the Pirates bat boy for the game that afternoon. After walking around downtown to get early lunches, the Pirates players all returned to the hotel to get a few hours rest before reporting to Berkshire Park at around 3:30 p.m. to begin pre-game warmups for their 4:30 p.m. game. Wagner was a former Pirates player (1897 to 1921), and was at the time their first base coach. It was Wagner’s second visit to Gloversville for a baseball game, as he had played an exhibition game himself as the shortstop for the Pittsburgh Nationals when they came to A., J. & G. Park/Parkhurst Field 30 year’s prior back on July 24, 1907. Pittsburgh was one of the few Major League outfits that were noted for putting as much into an exhibition as it put into a championship big league game and they used their regular line up to try to win any game (even exhibitions) at any cost. True to form, on the field that day for the Pirates would be four future Hall of Famers; Pie Traynor (Manager-inducted in 1948), Lloyd Waner (CF; inducted in 1967 ), Paul Waner (RF; inducted in 1952 ) and Honus Wagner (coach; inducted in Inaugural 1936 Class). A fifth future Hall of Famer Arkie Vaughn (SS; inducted in 1985) was with the team, but sat out of the line-up that day. Also on the field that day was Gloversville resident and former New York Giant star outfielder (1911-21) George J. Burns. Burns was in a Glovers uniform and served as a base coach for the Glovers for the game. The Pirates dugout was located on the third base side of the field and rather than walk across the field to the Pirates dugout between innings, Wagner would spend the half innings when the Pirates were in the field over at the scoreboard that was located on the first base side of the outfield. More than 2,000 fans attended the game and were delighted to see their hometown Glovers beat the 1909 and 1925 World Champions by a score of 11-8. Whitey Tulacz pitched a complete-game gem and was backed up by timely hitting from his team. In the eighth inning of the closely played game, the Glovers hit three consecutive home runs (something never done before or after in the franchise’s history) to stun the Major League visitors. And within minutes of the last out, the Pirates were back on a train and headed home to Forbes Field in Pittsburgh to resume their regular season against the Philadelphia Phillies the following day. There will be a special dedication ceremony the weekend Aug. 5/6 to place a historical base marker inside of the Runnings Supply Store at the spot where second base once sat at the former Berkshire Park/Glovers Park. The marker will denote this historic event and the history of Glovers Baseball on the grounds. On hand to help dedicate the Marker will be former Gloversville Glover (1951) Ralph Vitti (aka Michael Dante). I would like to give a special thanks to my dear friend, attorney Michael Geraghty, who provided much of the history and inspiration for this and many of the stories that I write. 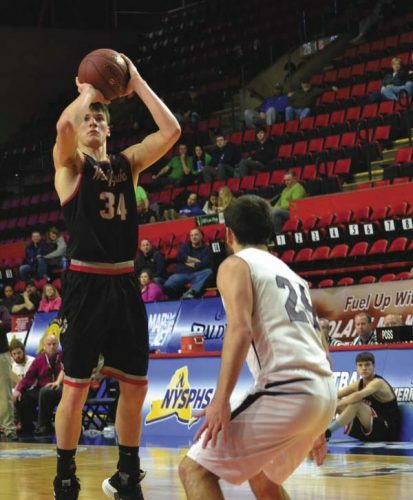 He is a walking-talking encyclopedia of sports history (local and national) and a true asset to Gloversville.